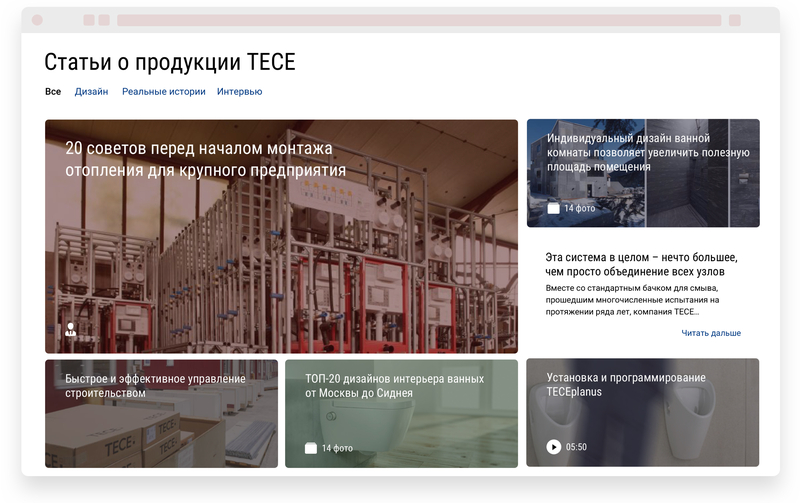 TECE — international company with head quarter in Emsdetten, Germany. The company manufactures and sells its domestic engineering solutions across Germany and the world. 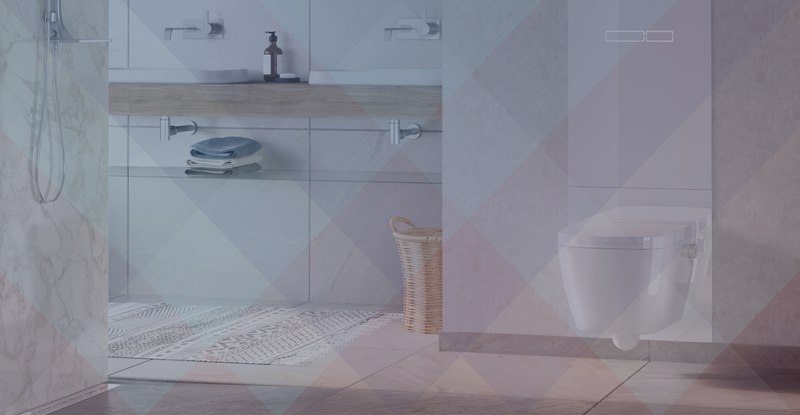 TECE sells module solutions for bathrooms, toilets, heating, gas installation, pipes and many other aspects of our life. 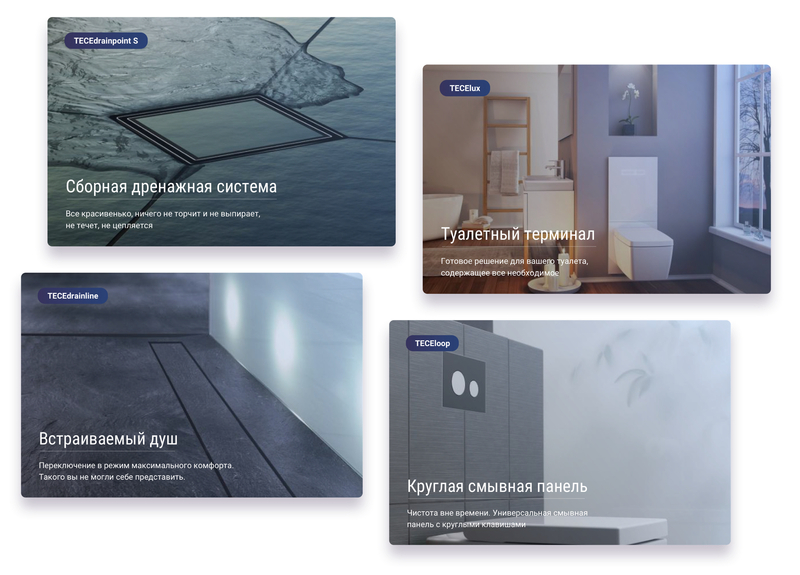 In the studio we created easy, friendly and well representative online catalog of TECE products for Russian market. Big cards present the groups of TECE products great. The idea of the groups is that you can use any group as a complete solution for according needs. 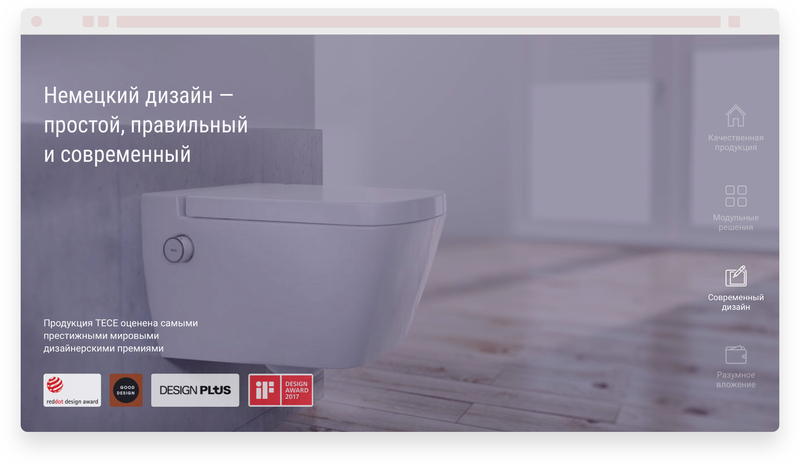 For example TECElux — this is a toilet terminal, includes everything what you need to install you toilet, its pipe system and flushing panels, including mass of additional awesome functions. We started from products' taxonomy. Old version had unclear structure, hierarchy was weird, names of the product wasn't telling users something (e.g. Suspended Sanitary System instead of just "a toilet"). We changed hierarchy and made just two big groups: For home, For business. Every group we splitted on subgroups as Bathroom, Toilets, Heating, etc. 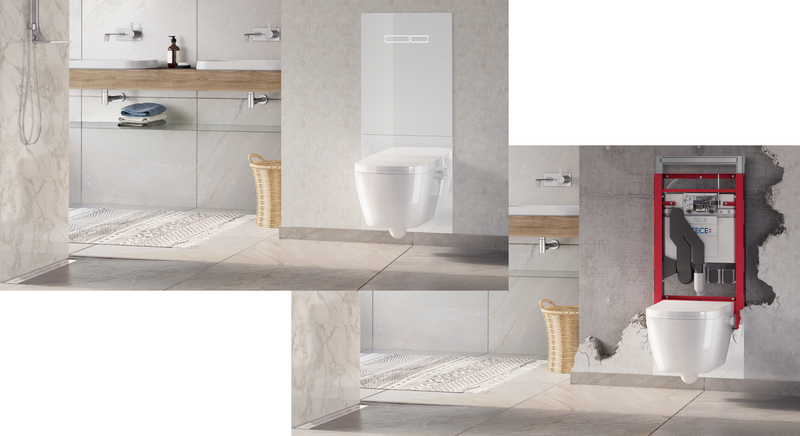 To demonstrated hidden behing a wall toilet systems we created 3d model of a bathroom, created models of toilet system itself, put this behind a wall and made coold picture with crashed wall to show this by click on home page. You're individual and your home is individual. Every user want to have there individual equipment, for bathrooms and toilets as well. 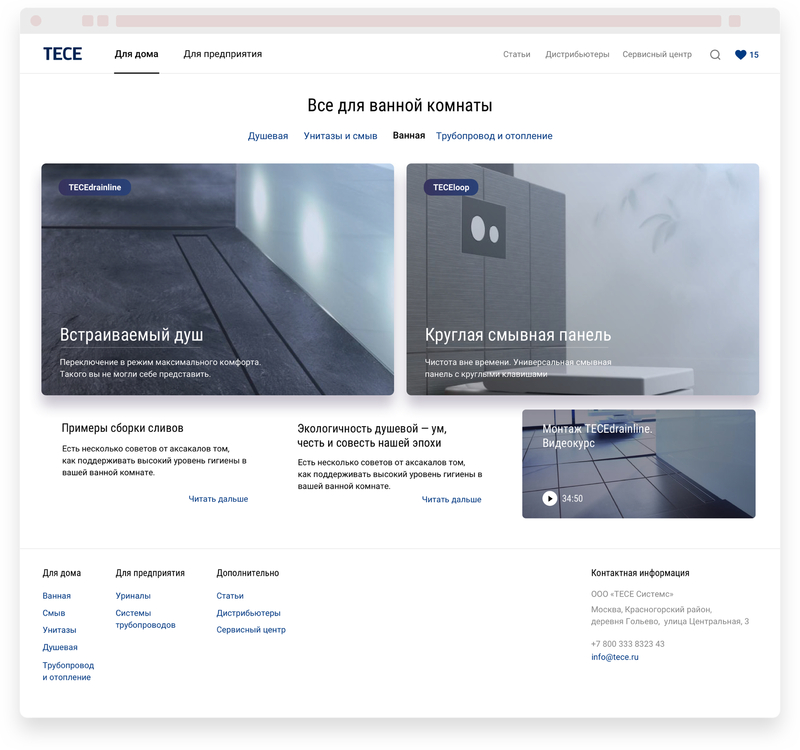 That's why TECE Catalog has a configurator where user can easily step by step build her own product for her house. You can choose alternative options and additional functions. In the end of the way the catalog will show you a dealer that has everything what you chose and final price of your selection. 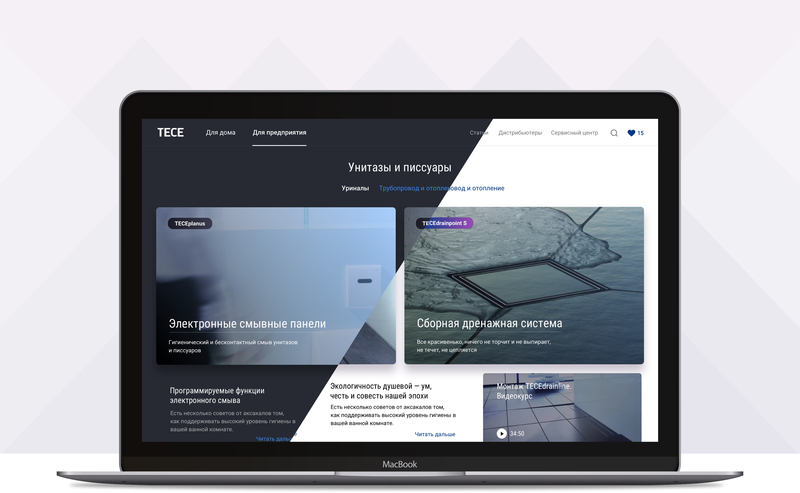 Business part of TECE catalog looks different: dark colors, more detailed information, different focuses in the content. 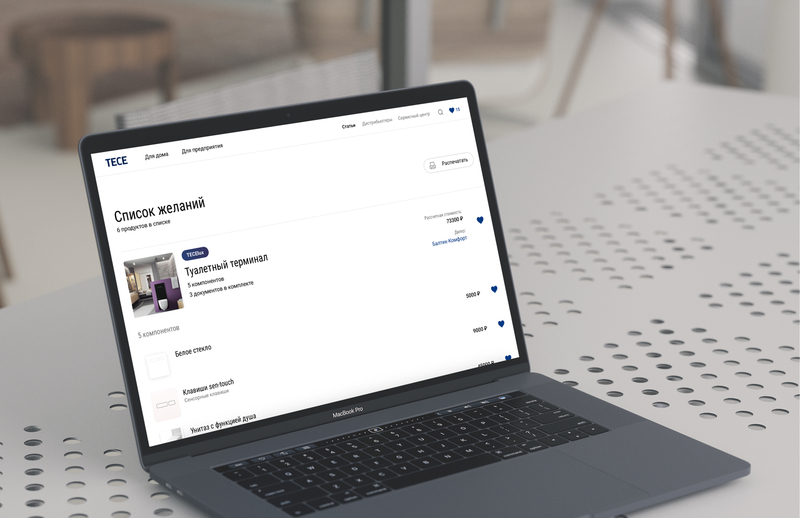 User has a wishlist to collect products she is gonna buy and save configured product. 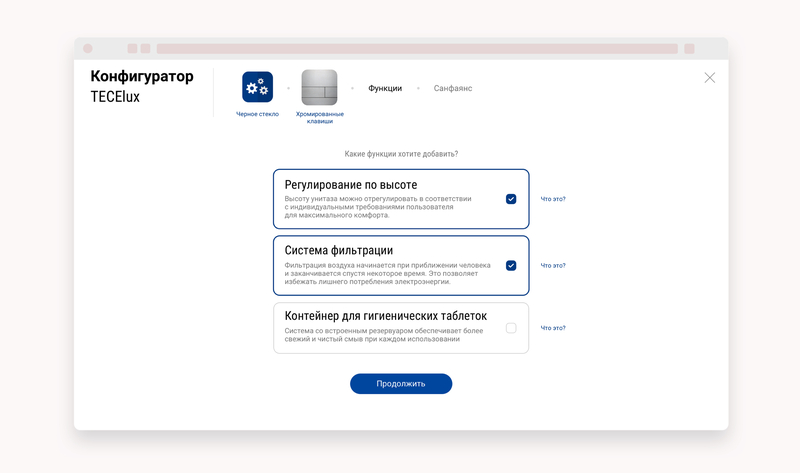 In wishlist list of dealers, that can sell all the wishes user has, is shown with information if dealer doesn't have some of the items. 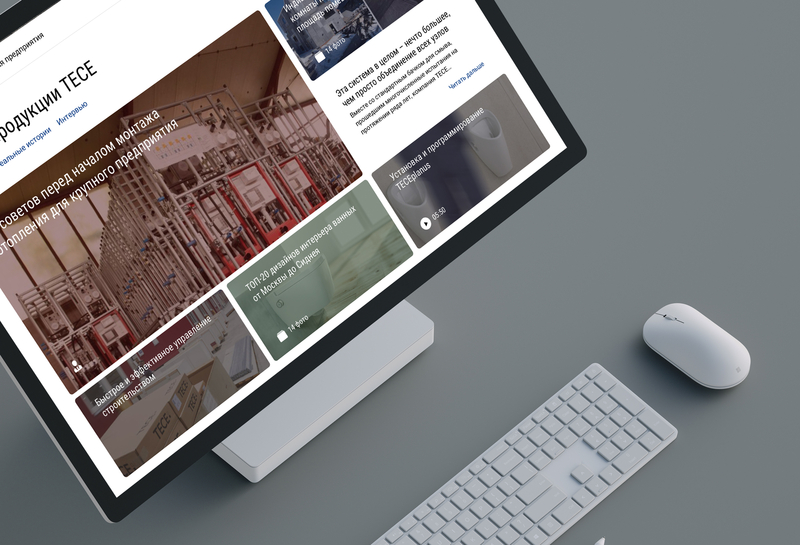 Section Articles was designed to contain rich assortment of the artisles about TECE products: interviews, video presentations, photo galleries, success stories, news, promo actions.